It's been a year since Bernie was busted for that billion-dollar Ponzi scheme of his, and already he's served five months of his 150-year sentence (only 1,795 months to go; perhaps six or seven fewer if Bernie behaves himself). "I'm sitting in class and these children, two-and-a-half-year-olds, are standing around, pretending that they're on a farm. And the teacher is asking, 'what sounds do you hear on a farm?' Like a cow, moo-moo, and a duck, quack-quack. And I'm hearing all these animal sounds, and all the kids laughing and applauding, and my cell phone rings. 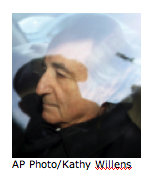 And it's Bernie Madoff. And he tells me that he's been arrested by the FBI. He's handcuffed to a chair. He needs my help. And in the background, I'm hearing, 'moo-moo, quack-quack, oink-oink,' and I ran out of the class."